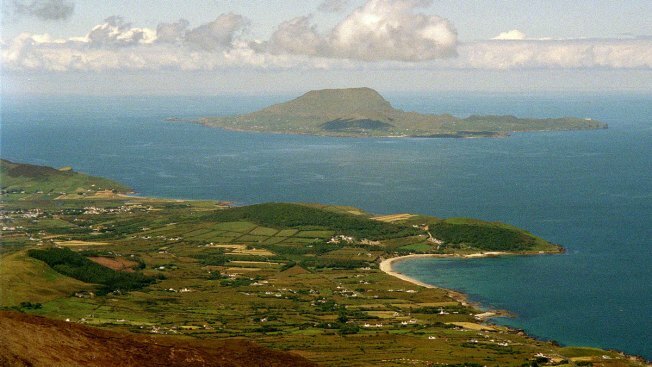 This June 21, 2004 file photo provides a view of Clare Island from the top of Croagh Patrick, the 2,510-foot peak in County Mayo where St. Patrick supposedly fasted for 40 days in 441 A.D., in Ireland. Just in time for St. Patrick's Day, March 17, 2016, genealogical research website Ancestry.com is making available 10 million Catholic parish records from Ireland available online for free to help people trace their Irish heritage. Just in time for St. Patrick's Day, genealogical research website Ancestry.com is making 10 million Catholic parish records from Ireland — some dating to 1655 — available online for free to help people trace their Irish heritage.